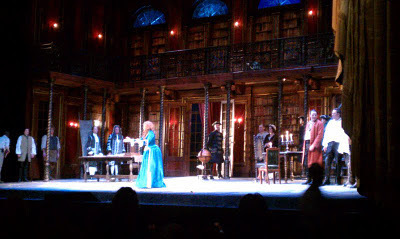 I was lucky enough to attend the dress rehearsal of Rodelinda at the Metropolitan Opera today. In 2004, Rodelinda was the first opera in which I saw Renée Fleming perform - I specifically bought my subscription so I wouldn't miss out on seeing her and I absolutely loved it. I saw it again during the 2006 run. It's a baroque opera by George Friderik Handel - light, bright and beautiful. It's the story of attempts at staking power, mistaken identities, misunderstandings, best of all lost and found love. The second act especially is achingly beautiful. The finale is triumphant. The production, directed by Stephen Wadsworth, is set in a beautiful palace outside of Milan - and is one of my favorite sets in all of opera at the Met. As expected, it was wonderful today. Everybody was in terrific voice and it all went smoothly. I took my friend Byrne Harrison, who writes Stage Buzz. It was his first time at the Met Opera and he loved it. He couldn't get over how good the singers sounded - he said it was like they were just playing a recording and of course, he loved Renée. After, we visited briefly with Renée. I can't wait to see her again in this opera at a regular performance! Also, during one of the intermission breaks, I met Angela Meade! What a thrill! Oddly enough, I discovered opera through Rodelinda too. With Anna Caterina Antonacci in the title role. Can. Not. Wait. for the HD broadcast! How do you know Renée well enough to visit her afterwards so often? I'm seeing her in London concert soon, and then in Baden Baden for Ariadne. Would love to meet her!